Low back pain is pain that occurs in the lumbar area of your back. Five large vertebrae make up the lumbar area of your spine, which is very flexible, allowing you to lift, twist, and bend. Your spinal cord and spinal nerves at the lumbar spine level send signals for sensation and movement through your buttocks and legs down to your feet and toes. 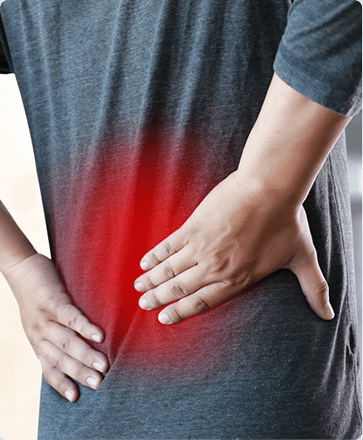 While back pain can be caused by many things, the most common culprits are poor posture, muscle or ligament strain, arthritis, osteoporosis, spondylolisthesis, spinal stenosis, degenerative disc disease, or herniated discs in the spine. Low back pain can occur at any age and may range from mild to severe. While over-the-counter medications may be effective in treating back pain, your doctor may prescribe stronger pain medications if needed. Physical therapy, including specialized exercises and stretches, can help relieve pain. Depending on the type and level of your pain, you may need more advanced treatments. The first step in pain management is to locate the cause or source of your low back pain. When treating back pain, it’s helpful to keep a log of when the pain occurs, where it occurs, and the severity of the pain you are experiencing. Be sure to include a rating of your pain from 0-10, with 10 being the worst, and if anything makes the pain worse or better. Rating your back pain is a good way for your doctor to understand the severity of pain you’re experiencing. If back pain is accompanied by numbness or weakness, it may indicate damage to the spinal cord. If the pain radiates from your lower back down the leg and into the calf, the problem could be sciatica, or damage to the sciatic nerve. Back pain accompanied by fever or upsets in urination or bowel movements should be checked immediately by a medical professional. Pain can have a negative effect on both your physical health and state of mind, but the right pain management treatments can get you moving and active again, leading to a happier, healthier life. To schedule a consultation with one of our pain management doctors , please call Chicagoland Pain Management in Bolingbrook, IL at (630) 312-4505 or in Hinsdale, IL at (630) 856-6825 or use our convenient online appointment request form.